Connecticut’s debt crisis is coming to a head. Credit-rating firms believe the state’s financial situation is now beyond repair. What’s more, experts suggest the rest of the country could soon follow. After getting hit with a credit downgrade to junk status in July, the city of Hartford was downgraded yet again in late September. Both Moody’s Investor Service and S&P Global Ratings dropped the city’s ratings further into ‘deep junk’ status. These massive downgrades essentially imply that Hartford now sits just above rock bottom on the credit scale, and that the two rating firms see the city as being in immediate risk of default. S&P slashed its rating by four notches to CC, and Moody’s dropped the city two notches to Caa3. “A default, a distressed exchange, or redemption appears to be a virtual certainty,” S&P analysts said. Moody’s cited an “increased likelihood of default as early as November” and said its rating reflects its expectation that bondholders will recover just 65 to 80 percent of their principal investments. Meanwhile, the Connecticut state government is hopelessly underwater. Running a $3.5 billion deficit and shouldering $68 billion in pension debt, the state seems to have little alternative to outright bankruptcy. 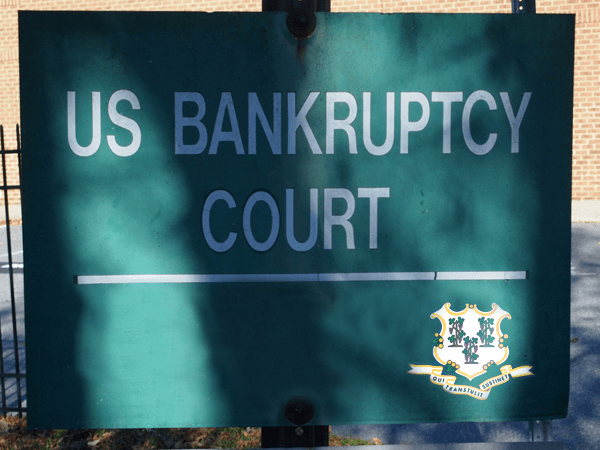 No state has ever declared bankruptcy in U.S. history. Connecticut could be the first… that is, if another troubled state doesn’t beat them to the punch. What’s happening today in Connecticut is far from an isolated incident. Rather, it’s a warning of a much larger trend occurring throughout the country. Illinois already holds the lowest possible credit rating from Moody’s, due to its $15 billion in unpaid bills and $251 billion in unfunded liabilities, which we reported in July. And it’s the only state that’s operated in absence of a complete and balanced budget for nearly two years. Similar crises are brewing in states across the nation, including in Pennsylvania, Michigan, and California, to name a few of the worst — not to mention the rapidly deteriorating situation in Puerto Rico. Today’s multitude of failing state governments all drank from the same poison cup: debt-fueled spending. Debt-fueled spending feels great because it boosts the economy in the short-term, and pushes markets higher. Plus it buys the things politicians want (including votes), even though they know their governments can’t afford them. But now the bills are coming due. More debt isn’t a feasible option anymore, and the money simply isn’t there. All the growth and expansion that made debt-fueled spending seem worthwhile is about to be swiftly undone. But here’s the scary part: U.S. states like Connecticut and Illinois aren’t the only ones who made this fatal error. National governments around the globe (ours included) have done the same. And when they fall, the damage could be catastrophic. Savvy investors and savers might very well see this as a sign to allocate a part of their portfolios in “safe haven” assets that have historically held their value in times of economic contraction.